Have you been listening? The traditional sales funnel created in 1890 is dead. It no longer represents how people buy today. But if you get rid of the funnel, you have to replace it with something, and we think the cyclone replaces it. The Cyclonic Buyer Journey™ does a much better job illustrating how people buy today. But even if you remove the funnel and replace it with the cyclone, you still need to understand your conversion metrics for your prospects throughout their buyer journey. 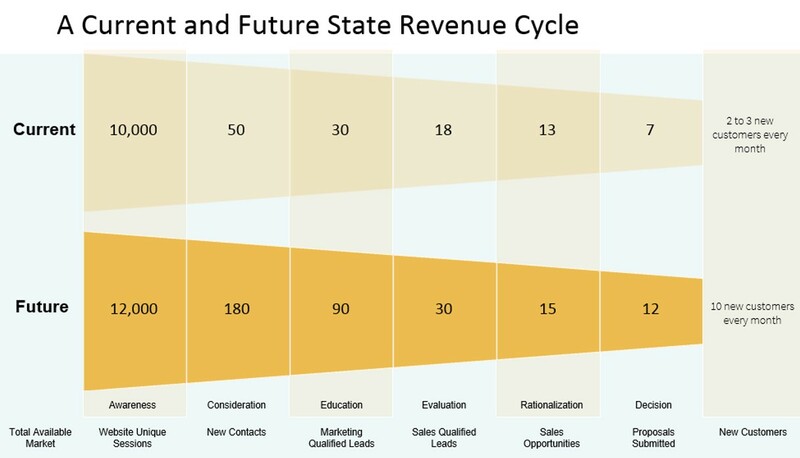 We use the term revenue cycle and the revenue cycle model (see the small picture at the top and the bigger one below in this article) to give you the insight into how your prospects are progressing from first touch to final signed agreements and the realization of new revenue. 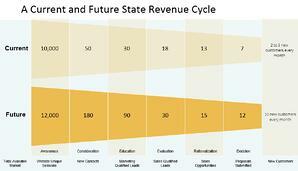 Here is a deeper dive into the inner workings of the revenue cycle and how it maps to the Cyclonic Buyer Journey. Do you know how many companies are out there in your area, that could buy your product or service, that need your product or service and that are perfect for you? Most companies don’t actually know this number, and they should. Now you might sell mozzarella cheese to pizza places, so it’s possible that your total available market is so big that you don’t have to worry about it, but most of our clients are not in that situation. Most of our clients are looking for the 500 biggest hospital networks, the top 100 private K-12 schools or the top 1000 manufacturers of metal objects in the U.S. Is there enough opportunity in those segments to drive your growth with the understanding that you will not beat your competition at all of those companies? Is that market rich enough, available enough and competitive enough to build a revenue cycle that gets you to your goals? The next metric in our revenue cycle is the number of visitors to your website. This is a captive audience, it’s an asset that can be leveraged and it’s a very early indicator of how well known your company is, how easy it is to find your company online and how many people are actually landing on your site every single month. As a revenue scientist, if you have 1,000 people visiting the site, my recommendations are going to be much different than if you have 10,000 people or 100,000 people visiting your site. This number is very important, and it’s equally important that you design tactics to drive this number up every single month. Typically, those tactics involve having the site pages rank on search engines, driving people to the site from other related sites, using email marketing to bring people back to the site, publishing content and stories on social media sites to drive people back to your website, and running paid ad campaigns on both social and search engines to capture even more people and drive them back to your site. The more significant the audience coming to the site, the easier it’s going to be to create the additional marketing and sales touches to build and nurture an effective revenue cycle. If you’ve adopted any of the new rules of marketing, then your website is filled with content (some gated and some ungated). That gated content is strategically placed across your site in context to the people visiting the key pages on your site. For example, if you have a page for CFOs, you have CFO content. If you have a page for your manufacturing vertical, you have manufacturing content. If you have a page for people very early in their buyer journey, you have early-stage buyer journey content on that page. The results should be conversions. People who you didn’t know previously are coming out of the forest and providing you with their contact information. Typically, these people are so early in their buyer journey that they don’t want to speak with a sales rep, but they do want to learn about you, your services and your perspectives on their industry. Site-wide conversion rates generally run between 1% on the low end and 3% or high side, but I’ve seen site-wide conversion rates for some clients pushing 5% and even higher. This process produces a steady stream of new names, new contacts and new inquires for your business. These people are very early in their buyer journey. Technically, these are leads, but they’re leads that need to be nurtured. Of these new inquires and new contact names, about 50% will be people who are active in their buyer journey and active enough to be considered marketing-qualified leads. You can use a number of ways to determine if they are actually marketing qualified or not. One way is to use attribution modeling, which could include a number of behavioral signals, like key pages visited on the website, offers downloaded and number of pages visited. Other ways include using demographic information like size of company, number of employees or other answers to key questions in the form completion process on your site. You could build a lead scoring model that would provide even more information on the quality of the lead, creating an actual quantitative score based on any number of variables and attributes like the ones we discussed above. New contacts that pass through a specific threshold would be considered marketing qualified. The Cyclonic Buyer Journey illustrates that most of the buyer journey is going to happen before anyone expresses an interest in talking to sales. But eventually, those people whose buyer journey has progressed to the point of needing to talk with sales will eventually ask to talk with sales, and this turns a marketing-qualified lead into a sales-qualified lead. Not all sales-qualified leads are created equally, so a few more steps are needed to understand this stage of your revenue cycle. Sales-qualified leads need to be scored and further qualified, just like the marketing-qualified leads. This can be done with automated lead scoring and with a qualification scoring methodology that the sales team would execute. Generally, we recommend that prospects who want to talk with sales get that opportunity, and then sales decides if they continue with the process or not. 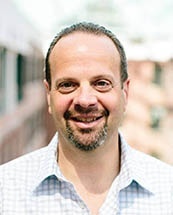 Usually, the conversion rate on sales-qualified leads to sales opportunities (the next step in the revenue cycle process) is highly dependent on the company, the industry and the company’s new customer acquisition strategy. At Square 2, only about 10% of our sales-qualified leads are sales opportunities, but for other clients that we’ve done sales enablement work with, this number can be as high as 80%. To narrow down this number for your company, think about a room filed with 100 people from 100 companies. They all need what you do. But can they all afford what you do? Are they ready to buy what you sell? Do they share your perspective on your industry? Are they going to treat you and your team the way you want to be treated? Are they able to make the purchase decision on their own? How many of the 100 would answer these questions in a way that would get your sales team excited to talk with them? If you think about half of them would be good for you, then you probably have a 50% conversion rate for sales-qualified leads to sales opportunities. There is a more scientific way to get this number. Just look in your CRM and find out how many first sales calls you did last month and how many of those moved forward (as qualified by the sales team to be active opportunities that they’re working on). This would give you a better, more data-driven number. These are usually easy to identify. They’re the deals the sales team is spending time on. They could be doing demos, creating proposals, assessing the prospect’s current state or more. Whenever the sales team starts considering the prospect as a viable opportunity is when it moves from sales-qualified lead to sales opportunity. Most of these will move from sales opportunity to the next stage of the buyer journey, which includes submitting and having them review your proposal, agreement, contract or recommendations. You’ve given them something in writing to sign or review. The conversion rate here is generally very high, usually between 80% and 95%. As I am sure you’d agree, you don’t want to go too deep with prospects if you’re not going to have a good opportunity to win the business. If you’re working on sales opportunities, then they should almost always move on to produce submitted proposals, contracts or agreements. In our estimation, this should be roughly an 80% to 90% conversion rate. In some sales situations, this stage might be delayed or put off should priorities change, but the goal of providing prospects with formal recommendations and paperwork should be achieved at a very high rate. If you’re not performing at this level, it could be due to your final presentation, your agreement or your ability to help your prospects rationalize their purchase decision. References also have a tendency to slow this process down as people try to connect. Again, you can shorten this part of the sales process and accelerate your overall revenue cycle. Finally, the end game. New customers and new revenue are just a signature away. If you’ve invested a huge amount of time and energy in working with prospects, you’d better be closing them at a very high rate. The best sales experts all agree that you don’t want to hear no at this stage in the process. You should be working to get a no much earlier in the process. Back here, you want to hear yes 90% of the time. When you submit your recommendations, you’ve already done so much work to get the prospect to emotionally want you and to have rationalized their purchase decision. You’ve worked directly with them to build out personalized recommendations. If you are not closing at this level, you should look at many different aspects of a very complex process — everything from qualification criteria to the ongoing checks on progress, and ultimately the documents you provide clients for signature and the posture you take during these late-stage conversations. But the best approach is to look at your entire revenue cycle and make sure you’re working month over month to optimize the entire process and all of the conversion rates. This is how you’ll guarantee that your revenue growth improves month over month. Start Today Tip – Start looking at your revenue performance in a much more holistic way. We’ve been applying this more strategic approach to marketing for years, and now we’re applying it to sales and overall revenue growth. This more scientific approach gives you the metrics and tools to start tracking individual stage performance and identifying where the friction is and how to remove it. 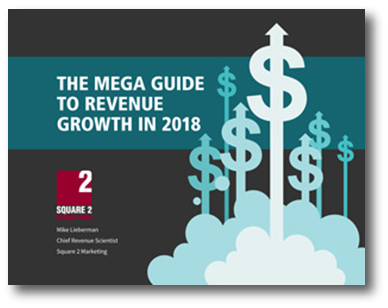 Making smaller changes at each stage of the revenue cycle actually produces big gains in terms of increased close rates, shortened sales cycles and more efficient use of a sales rep’s time. All of these contribute to a scalable, repeatable and predictable revenue generation machine.